Originally started in 1985 as a commercial and residential landscape company, Center Valley Landscape, Inc. expanded into the tree salvage business with the purchase of our first tree spade in 1989. Although no job is too small, we are the company to turn to when plans dictate large quantities of trees to be saved. 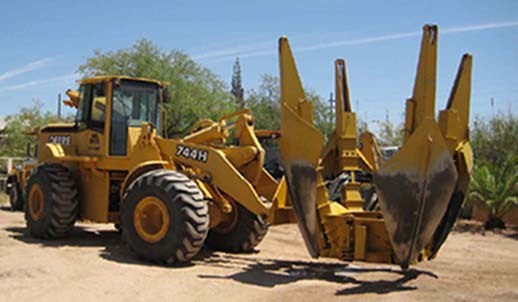 Our large fleet of truck- and loader-mounted spades allow us to move out salvageable trees quickly, efficiently and with high survival rates. In general, trees with trunk diameters up to 10 inches can be moved but soil conditions and type of tree must also be considered. Loader-mounted tree spades are best suited to sites with sandy soil conditions and where tight maneuverability is critical. 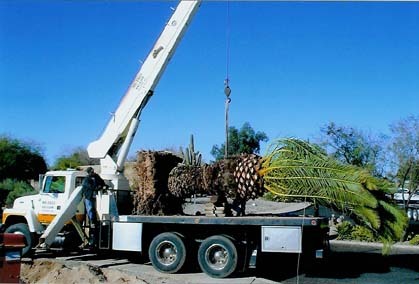 A 17 ton boom truck enables us to transplant palm trees.